Even if you are just visiting Yosemite National Park, or you’re a current resident of Fresno, California, knowing where to find a qualified holistic dentist is always beneficial. In such a busy tourist region, it may be challenging to find a dentist who is available when you need them. But, the search doesn’t have to be. We make it easy to find someone qualified when you are in need, even at a moment’s notice. Emergencydentistsusa.com can make your search quick and easy when it comes to finding a holistic dentist in Fresno. With a simple search you can find a list of holistic dentists, their operating hours, services they offer, and the payments accepted. If you are experiencing a dental emergency or require a difficult procedure, we can help provide you a listing of experienced dentists who can get the job done. If you cannot get online to search through the listings, you can place a call into our toll free holistic dentist finder number. One of our many, highly qualified agents can assist you with your search for the right dentist. When you have decided on a dentist to see, our agents can even schedule your visit for you and give you detailed directions on how to get there. You will also want to ensure you take your identification with you, as well as insurance cards and any copays that might be necessary. There are a few different choices when it comes to finding a holistic dentist in Fresno, California. 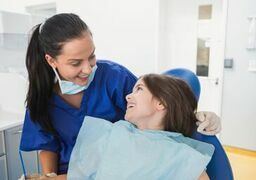 Description: If you are searching for high quality dental care in a personal and comfortable setting, the Mirelez Wellness Dental group may be right up your alley. They offer services from emergency care to root canals and everything in between. Description: For over 19 years, Dr. Larsen has been providing patients with mercury-free dentistry. His practice is also the leader in safely removing toxic materials from dental treatments. His team ensures that each patient feels welcome and is comfortable with the treatment that they receive. Description: From general dentistry to cosmetic dentistry, Sylvania Dental offers a host of dental services. Whether you are experiencing a dental emergency or just in need of some routine treatments, they can help you during your time of need. They offer holistic treatments and take pride in teaching their patients preventative techniques. Deciding on which holistic dentist to see can be a big decision. Going the holistic route means you are more aware of the ingredients in the products you are using. This means you’ve chosen to live a much healthier lifestyle. Choosing to be holistic gives you the opportunity to be healthier for your body and the environment around you. Just like with any other dentist, you should always make sure you check out their qualifications to ensure they are experienced and properly certified. You can easily view these particular credentials by asking the receptionist at your appointment for them. If you prefer to view them before your appointment, you can simply search the California Dental Association website by searching the dentist’s last name.